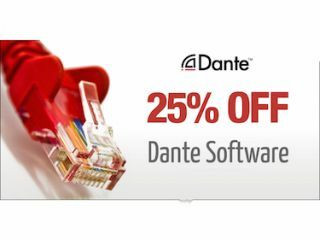 Audinate, creator of Dante is running a limited-time, 25 percent off promotion for Dante software. The “InfoComm Special” runs through June 15 and applies to permanent licenses of Dante Via and Dante Virtual Soundcard. Dante Via is affordable audio software that networks your computer's audio applications and devices. It allows you to network USB, Firewire, and Thunderbolt devices and audio applications, monitor channels on a Dante network, and connect computers together in an instant Dante audio network. Dante Via normally sells for around $50, but during the promotion customers can save over $12. Dante Virtual Soundcard is audio networking software that turns a computer into a Dante-powered workstation. It is an application with the single purpose of getting a large number of channels in and out of a computer, seamlessly integrating a PC or Mac with Dante audio devices on your network. Dante Virtual Soundcard normally sells for around $30, and will be discounted by more than $7 during the promotion. To learn more about these software applications and the promotion, visit www.audinate.com/25off.